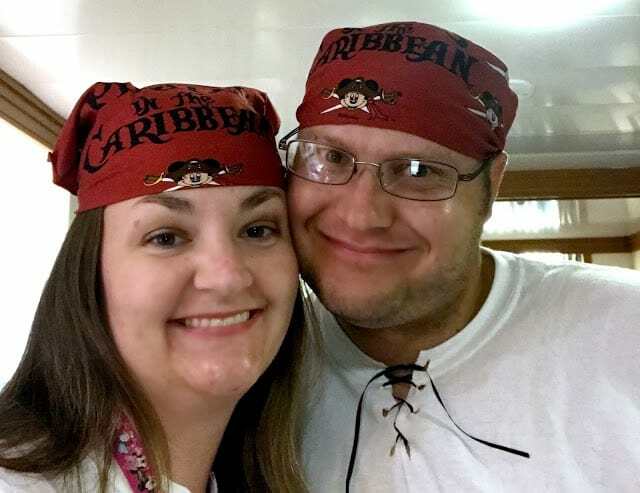 I am in disbelief that we have been home from our Disney cruise for nearly a month. One of the biggest nights on the ship is Pirate night! Everyone dresses up and if you are anything like our family, you absolutely want to participate. 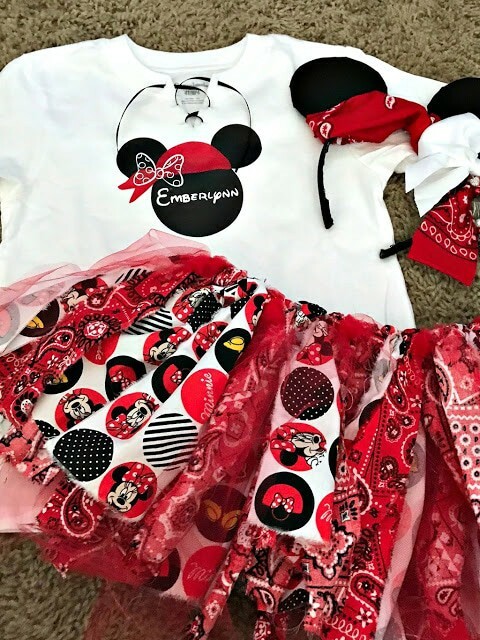 I decided to share our awesome Disney cruise pirate night outfits and some ideas on how to make your own pirate night costumes! 1 yard each of 3 different fabric designs. Next you will need to download this file and import it into your diecutting software. I use either Cricut Craft Room or Silhouette Design Studio. Download this file here. Let’s start with the Disney cruise pirate night bottoms. First you need to purchase some black pants. I found these sweatpants for about $5.00 at my local Walmart. Then I had my husband and son try on the pants, marked an area to cut them into shorts and them removed and cut them. The first leg I just cut without a pattern, but the second leg, I went ahead and followed the same cut pattern as the other leg. The boys bottoms were easy for sure and only took about 5 minutes to get both pairs done. My boys loved that they were comfy and adjustable! 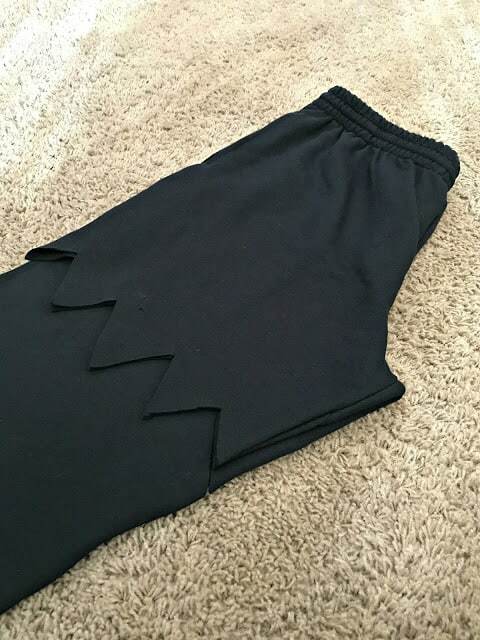 You could also search thrift stores for black pants and cut them too. 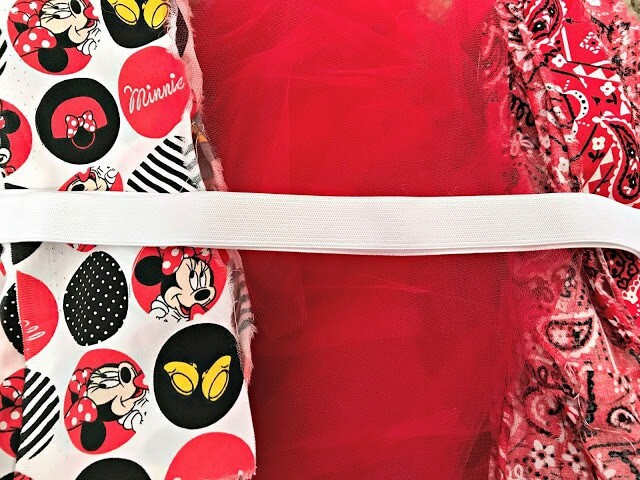 For the girls, we went with fabric tutus. First thing I did was take the elastic and measure our waistlines. Then I cut the elastic to fit us, used my sewing machine and sewed the ends together and then double checked the fit on both of us. You could also easily hand sew the ends, I just was going for quick and my sewing machine was already out. Next, I cut the fabric into strips varying from 1.5 inches to 2.5 inches in width. After they were cut, I made piles of the different fabrics and started to tie them onto the elastic in a random pattern. You can see how I tied them in the photo above. I just continued to tie them on until the entire elastic was full. Once the bottoms were done, I went ahead and started on the tops. First, I made everyone try on their shirts and I measured from the center of the collar down about 2-3 inches depending on the person and made a straight cut down. Then I had everyone take their shirt off and I converted the straight cut into a “V-shape” and made little slits on each side of the “V” and threaded the black ribbon through. Finally, I used my die-cutting machine to cut out the file from above and personalized it for each person. 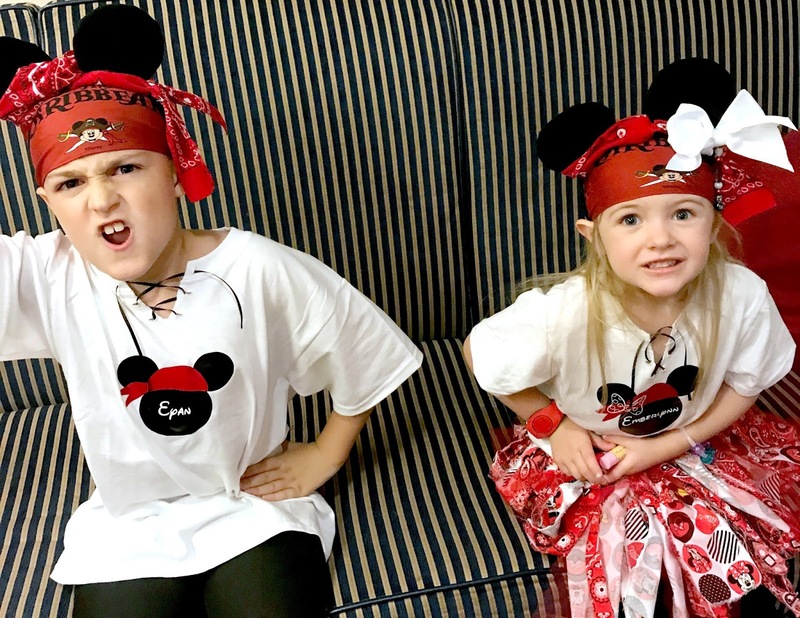 Once they were cut out, I layered them on each shirt to create our little Mickey pirates. When pirate night came, we were ready! We also got a ton of compliments on our costumes and to top it off, we were also really comfy. Under the tutu the girls wore black leggings and I made some Mickey ears with a pirate theme to them as well. I was going to include that tutorial, but honestly I just googled, how to make Mickey Ears and went with it. They were a little rough for sure, but looked cute. 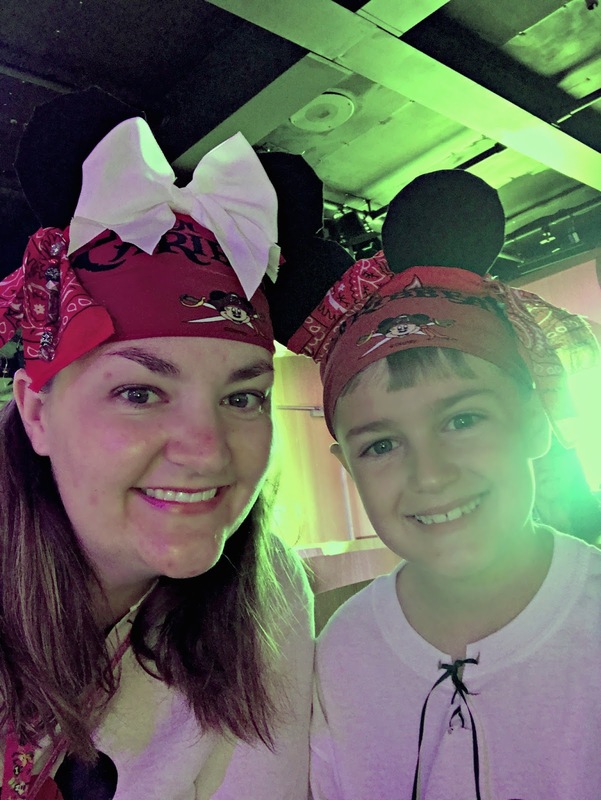 Pirate day is full of fun! The whole day is complete with all the pirate activities you could imagine. 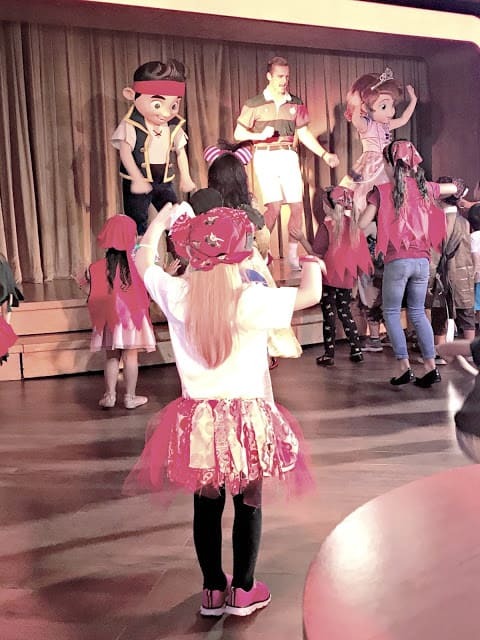 We had a blast at the Disney Junior Pirate Party with Jake and Sophia and then enjoyed an awesome dinner complete with Pirate themed servers and a little show. Disney does provide every guest with their own Pirates In the Caribbean bandana to keep and wear and nearly everyone does! It is such a blast to dress up, play, pretend and laugh with each other. We had a great time! To end Pirate Night, Disney puts on a great show on the top deck and ends with a finale of fireworks at sea! My cautionary tale to this one is that your little ones might be wiped out from a day of fun and may fall asleep while waiting for the fireworks to start (it was nearly 11:00PM when the finally started). I would plan ahead for that and try to get some naps in. We didn’t have that luxury because our excursion was that day so we were busy all day, then it was pirate events, dinner and fireworks. If you want to purchase the items featured in this post, check out my affiliate links below. I do make a small commission from your purchases. Interested in other DIY projects to make your Disney Cruise a success? Check out my Disney cruise door decorations project! Previous Post: « Wonder In Theaters TODAY! Oh my goodness! These are amazing! I’m going to do my best to copy you. 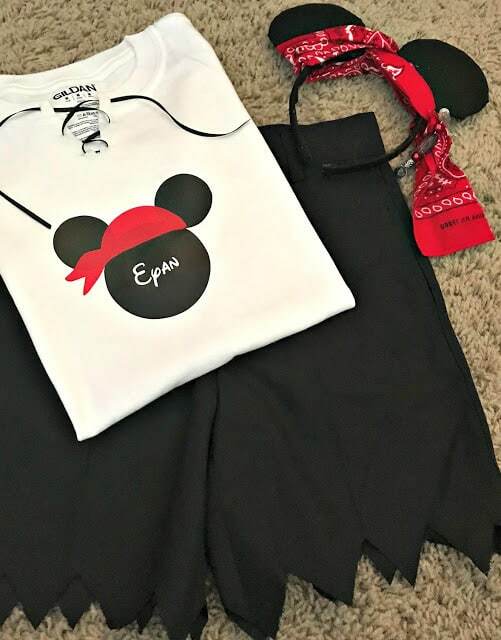  We are going on our first Disney cruise over Halloween this year. I can’t stop thinking about it. Where did you find that adorable Disney fabric? 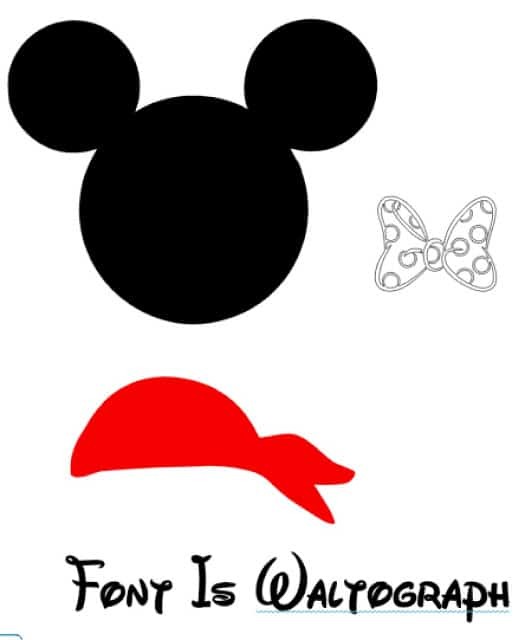 And did you have a favorite tutorial for the Mickey ears? Thanks! I got the fabric at Walmart! The cruise was amazing we are already planning our next one. 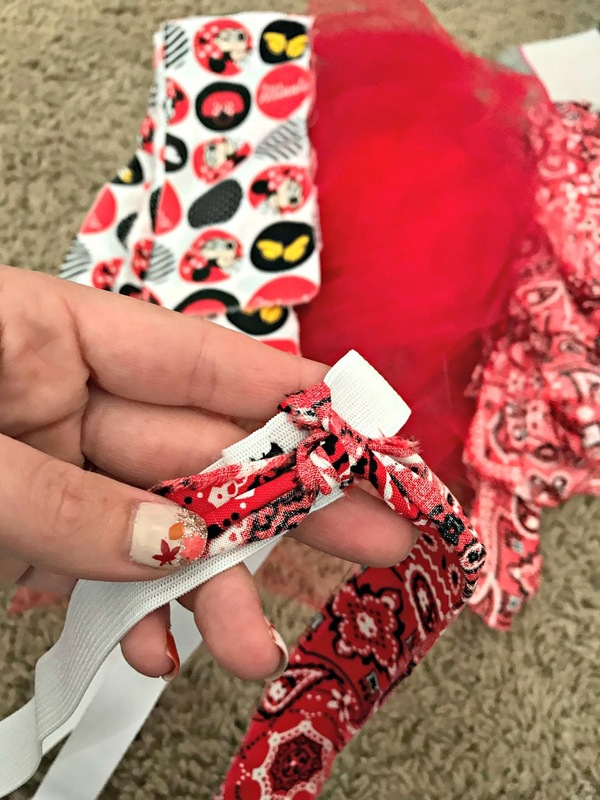 For the Mickey Ears I think I just used the first site that came up when I googled “how to make Mickey Mouse ears with a headband. Can you tell me how long the strips were that you cut? Thank you! She was pretty tiny, but they were about 2 ft long.